The Glimpse by Claire Merle. Publication : June 7th, 2012 by Faber and Faber. I'm honestly thrilled to feature Claire Merle and her debut novel The Glimpse on the blog today. For those of you who haven't heard of the book already, it's an awesome dystopia novel and it's out in stores today! This is a pretty awesome blog tour, there's also a super fun event going on online called The Tamsin Diaries, details of which will follow the interview :) So keep reading and move on to the giveaway at the end of the post! Scatty, (yes, I did leave the keys in the front door when we went away on holiday for a week. You should have seen my husband's face when he found them! No, we were not burgled) obsessive (ask my agent), romantic. What inspired the story of The Glimpse? The fundamental idea came to me around ten years ago when I went to a talk on the state of mental health in the US. I was alarmed to learn about the rapidly increasing number of children being prescribed medication such as Ritalin (an addictive amphetamine-like stimulant which the US government classifies alongside cocaine and morphine) for behavioural problems. I began researching further and asking myself a basic question: if mental health continues to progress in the direction it’s headed on, what kind of future will we live in? The Glimpse was my rather disturbing answer. Ana’s core internal problem of whether she can trust her own judgment is something I can relate to. When I was eighteen I went through something intense and the feelings I had at that time became a sort of internal compass for me while I was writing The Glimpse. I'd like to think I was as strong as she is, but hard to know until you're put to the test! I'm not sure I could name just one. A couple of my favourite book's growing up were The Handmaid's Tale by Margaret Atwood, and Rebecca by Daphne du Maurier. Two of my recent favourites include 'The Sky is Everywhere' by Jandy Nelson and The Gift by Alison Croggon. Are there any authors who have influenced you? If yes, who and how? That's a really hard question. I'm sure I've been influenced in many ways by books I've loved, admired or even disliked. But ultimately, I think the emotional journey that a writer takes their characters on is something personal which comes from within. I have my own 'issues' and themes I want to explore through my writing, and while I deeply admire many other authors, I try to stay true to myself. Bike riding with my kids, hanging out & drinking coffee with friends, snuggling up by the fire with a good book, discussing 'life, the universe & everything' with my husband, and watching romantic comedies. What's the one thing that you can't live without? 'He did have layers, but like an onion they were all the same.' Beryl Bainbridge. 'She supposed that houses, after all -- like the lives that were lived in them -- were mostly made of space.' Sarah Waters, The Night Watch. Any other book(s) in the works? Upcoming projects? I'm currently working on book 2 in The Glimpse Duet. (There will only be 2 books in The Glimpse series.) I also have two other stories on the back burner -- a YA fantasy that edges into sci-fi, and a YA contemporary. Pick One : Twilight or Hunger Games? I loved reading Claire's answers and I hope you did too :) Click on the image below to see the list of the rest of the stops in the blog tour. Also, as promised, here's a sneak peak of The Tamsin Diaries! For more information, check out The Spark Facebook Page, The Glimpse Facebook Page or go to http://findtamsin.blogspot.co.uk/. Giveaway is open to people from US, UK and Ireland Only. Giveaway Prize is a finished copy of The Glimpse by Claire Merle. It is the author/publisher's responsibility to ensure that you get the book, I'm in no way responsible. Claire wrote her first paranormal screenplay at the age of thirteen and named it after a road sign. DANGER ALIVE never made it to the big screen, but she continued to write and daydream her way through school and university, graduated with a BA (Hons) in Film Studies, and spent the next few years working in the British Film Industry. 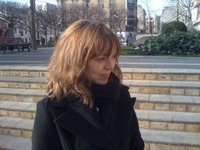 Claire now lives in France with her French husband and two young sons, and is an advocate for Human Rights. The Hunger Games is my favorite so far. The Glimpse is definitely on my list of books to read. Loved the interview...especially that she used the word "burgled" It's one of my favorites, haha. I LOVED Divergent! Fabulous-ALMOST-dystopian. Also loved Matched by Ally Condie! Great stop! Can't wait to read this! My favourite dystopian is Divergent! :) I can't wait to read The Glimpse! The Hunger Games and A Million Suns are a couple of my favorites. I fell in love with Insurgent, sequel to Divergent. :D And the book is on my to-read list. And the interview was awesome. The Hunger Games are sooo muchy better tahn Twilight. Definately Divergent ! Great interview. The Glimpse looks really interesting, can't wait to read it. I think The Hunger Games are the only dystopian books I've really read since I've become aware of what a dystopian novel is! I loved them all :) The Glimpse has been on my to read list for a while now - can't wait to get it! I would have to go with the Hunger Game thus far. Your interview was great! Love reading new things about authors. The Glimpse is on the TBR list! Divergent is my favorite so far. The Glimpse is most definitely on my TBR. Great interview!! I've really enjoyed Delirium and Blood Red Road. I've had this book on my TBR list for awhile and I think it will be a great addition to the dystopian genre. The interview was nice to read but i think the author should be careful when voicing her opinions. Ritalin and similar drugs, when used properly and on people suffering from certain mood disorders, are not addictive because of how they affect the brain's chemistry. It's probably important to say that before making a blanket statement. Thanks for the giveaway. My favorite dystopia has to be The Maze Runner series and Divergent series. The Glimpse has been on my TBR for a long while now!! The interview was interesting and quite witty! Wow that is some kind of dystopian society. I definitely want to give this book a look even though it won't be part of any challenge. Thanks for the generous giveaway. My favorite Dystopian novel is Atlas Shrugged I really enjoyed the interview and have been waiting for Glimpse to come out. I really loved the Hunger Games. Thanks so much! My favorite dystopian is Divergent. The Glimpse is on my to-read list and I want to get to it really soon. Awesome giveaway! Thanks for the giveaway! 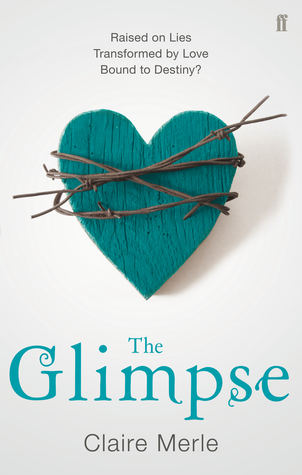 The Glimpse is definitely on my TBR wishlist. I don't know what my favorite dystopian is - Hunger Games maybe? My favorite dystopian keeps changing with each new one I read. My current fav is Divergent which I just finished two days ago. I just added The Glimpse to my wishlist on Amazon and I really enjoyed the intervew. It was a nice look into the life of the author. Great interview! The Glimpse is on my TBR list and as for my favorite dystopian it would have to be the avatar trilogy by Tui Sutherland, it was incredible and hilarious. There are so many great dystopian books - The Hunger Games trilogy and Wither are my faves but the more I read, the more I like! The Glimpse looks like another good one and I can't wait to read it! My favorite is The Hunger Games. It was the first I read and it was also the first YA book I read and it blew open a whole new world of books to me. I am also pretty fond of the Delirium series :) Oh yes, The Glimpse is not only on my list of to-reads but it's pretty high to the top. Thank you for the chance to win a copy! I really liked the Hungergames, Delirium Amoris, Divergent. Thanks for the giveaway! Favorite dystopia is Feed by Mira Grant. The Glimpse is on my to read list, as well as on my DAC! My favorite dystopian has to be the classic: 1984. It's one of my favorite books ever. This one is now definitely on my to-read list, though! Yes great like the book you are mentioning "Catcher in the Rye" I've read it couple times! And actually I've got ..
I’ve to admit that I hardly ever use Microsoft Phrase and I’m seriously impressed with what they have now!